Over the last couple of years, it has become popular to take the music of 60's and 70's bands and release new hit packages that contain both the A and B side of those singles. On September 15, Rhino will jump on that trend with the release of The Doors: The Singles. The second disc starts with Tightrope Ride, the first single from the three man version of the band, minus the late Morrison, album Other Voices. That's followed by singles released from the various later projects including Full Circle, An American Prayer and the 1983 live album Alive, She Cried. It finishes with four mono radio versions of hits. 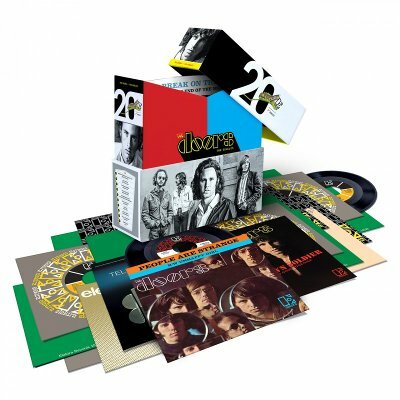 Look for The Doors: The Singles in a two-CD set, 2-CDs with the first time ever release of The Best of the Doors on Blu-Ray, and via digital retailers. There will also be a special vinyl box set with all twenty U.S. singles on twenty 7-inch 45's with original cover art in a flip top box.